The play's central romantic figures are a young nobleman called Bertram and an orphaned commoner called Helena. The problems with their romance are due to their different backgrounds and that it is at first a one sided affair with Helena falling in lobe with Bertram. Being a comedy, (albeit with serious undercurrents), Bertram comes around and All's Well does indeed End Well. It is believed that the drama was first performed between 1602 and 1603. 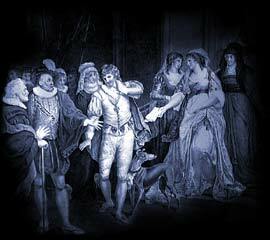 In the Elizabethan era there was a huge demand for new entertainment and All's Well That Ends Well would have been produced immediately following the completion of the play. It is believed that the script was first printed in 1623 in the First Folio. As William Shakespeare clearly did not want his work published details of the play would have therefore been noted, and often pirated without his consent, following a performance. The settings for the drama are in Rousillon, Paris, Marseilles in France and Florence, Italy. The quotes from the work are amongst Shakespeare's most famous including 'Our remedies oft in ourselves do lie'. Details of this famous quote follow, complete with information regarding the Act and the Scene, allowing a quick reference to the section of the play that this quotation can be found in. Please click here for the full text of the script of the play.